The campaign to spread Firefox to the four corners of the world has hit upon a new target: college kids. 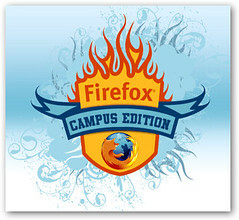 The "Campus Edition" of the Firefox browser will come bundled with three student oriented (?) extensions: FoxyTunes (a music player controller for that massive collection of pirated MP3s), Zotero (an online note-taking and research tool for plagiarizing your essay on postmodernism), and StumbleUpon (for random web surfing to distract you from your studies). Look for it to be released tomorrow, Wednesday, August 22, 2007. After the dubious eBay edition of Firefox and now the Campus Edition, what's next? The Canine Edition for dogs who love to surf the web?